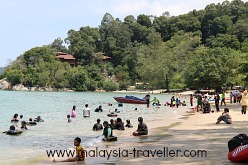 Teluk Batik Beach is located close to the towns of Lumut and Sitiawan and looks out towards Pangkor Island, Perak's top beach destination. The beach is situated in a pleasant bay with headlands rising at each end, topped with jungle. The beach itself is fringed with coconut palms and other trees providing a good amount of shade and a tropical atmosphere. The sea water is clean and blue and the sand is soft. The huge jetty of a nearby steel works spoils the view of the horizon but this is still a good beach which is why it was quite busy when I went though it was a public holiday. 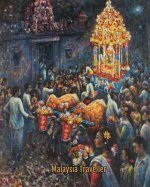 Significant effort has been made to provide all necessary facilities. There is a large car park for which a nominal fee is charged. Spacious hard landscaping includes a paved plaza area decorated with mini minarets. There is even a seashell museum (Muzium Siput) though this was closed during my visit and there was no indication when (or if) it will reopen. 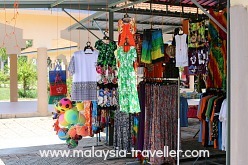 Dozens of stalls sell souvenirs, beach attire such as swimming costumes, hats and t-shirts, beach mats, inflatable balls and rubber rings as well as snacks, drinks, ice creams and so on. Toilets, showers and changing rooms are provided. 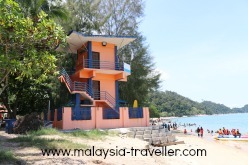 The beach even has its own 'Baywatch' tower from where vigilant lifeguards keep an eye on the safety of swimmers. Water sport activities include speed boat rides and being towed on banana boats and other inflatable devices. 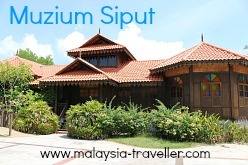 Address: Jalan Utama Marina Island, 32200 Lumut, Perak, Malaysia. I have marked the exact location on the map on my main Beaches and Islands page. Driving from Kuala Lumpur took me about 3 hours 30 minutes which means it is just about possible to do as a day trip but it would be more relaxing to stay overnight. 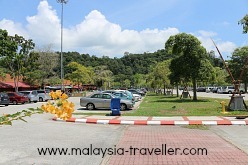 There are a number of hotels in the vicinity including the Teluk Batik Resort which is directly facing the beach. 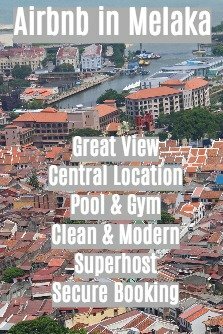 You can check on room rates and availability for this and other nearby hotels on Agoda's website by clicking here. 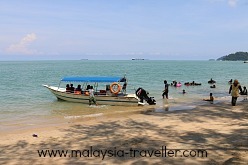 Nearby attractions include Pangor Island, Teluk Intan and the Pasir Salik Historical Complex. You can find details of all of these and many more on my Top Perak Attractions page.